My dog is very high maintenance and needed his bowls raised because of severe acid reflux! I happened to see these Weathertech bowls and had to have them and I wasn’t disappointed. These bowls are made with the same quality and craftsmanship you come to expect from Weathertech. They also come with a mat to so food and water don’t spill on the floor. You can also just use the bowls without the mat like we did. 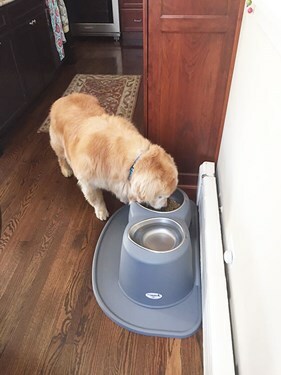 We purchased a PetComfort Feeding System for our 6 year old Golden Retriever, Archie. He loves it! And, to be honest, we do too. The bowls are super easy to clean and can go right into the dishwasher. This feeding system is the best! 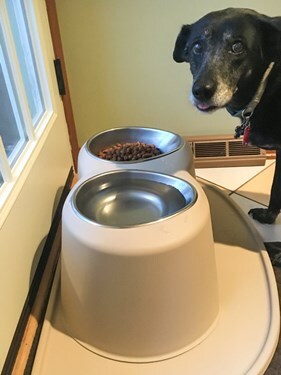 Payton Loves His PetComfort Feeding System! 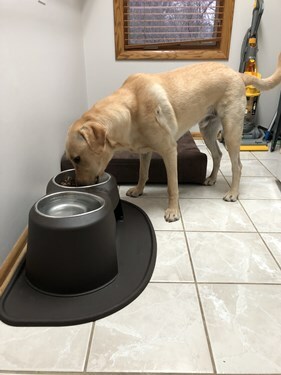 We bought Payton, our 18-month old Yellow Lab, his PetComfort feeding system last month, and he absolutely loves it! The bowls hold more food and water than the other bowls we were using for him, and that makes him VERY happy. And since he doesn't need to bend his neck to floor level to eat or drink, he is a lot more comfortable. My wife loves the fact that any mess he makes spills onto the base and not the floor, and it's easy to clean. We both feel good that he is eating and drinking from bowls that are safe enough for us to eat or drink out of if we had to. 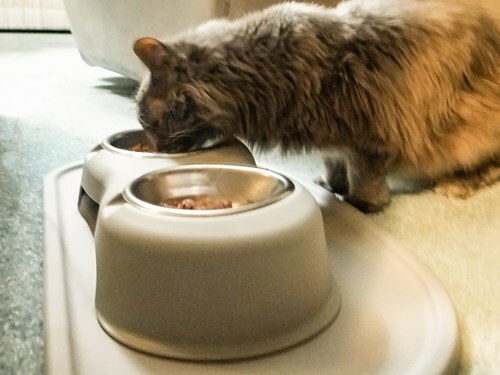 I'm so glad we found out about this feeding system, and would happily recommend it to anyone who wants the very best for the furry members of their family! I stopped at the Bolingbrook store the other day after I saw an ad for the pet bowls. I purchased a medium size set for my 18 year old cat who has not been eating right for weeks now. I figured she was preparing herself for her 10th life in the beyond, but I wanted to give her something high-end as a way to honor her last days. 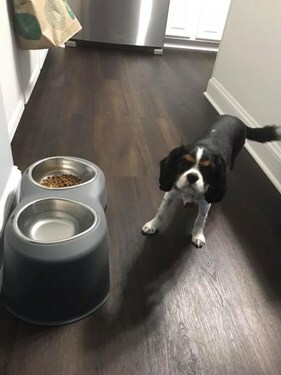 To my surprise, she has a renewed appetite and loves her new PetComfort pet bowls that she is now eating several times a day and has renewed energy as a result. Thank you for your continued innovation and commitment to quality excellence. Onyx loves her new Pet Comfort Feeding System and I love the design. The non-slip mat anchors the stand and bowls in place so that drips and crumbs stay contained. The finger slot makes removal of the bowls easy and cleaning is a breeze. It is comforting to know that bowls are made from food-grade stainless steel, and the contour shape fits perfectly in the refrigerator dispenser for filtered water. Best of all, this product is certified safe and made in the USA! 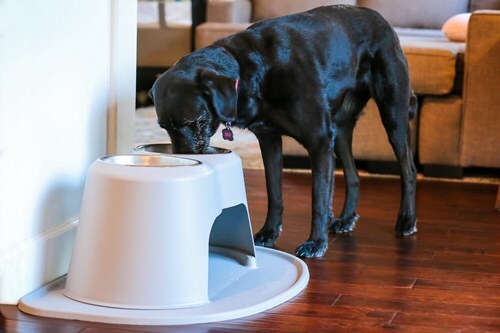 We love our new PetComfort feeder for our 70lb black lab, Cabo. We appreciate the peace of mind knowing the bowl and stand materials are non-toxic and love how the bowl shape and height are ergonomic. I have had 2 dogs die of cancer, and when I heard the bowls I was using could be contributing to it, I decided I need to do something. These bowls are absolutely amazing both stand and bowls are high quality and the colors are wonderful (red and blue). You can't put a price on the health of your pets. I spoil my dogs and I am always looking for the very best pet products on the market. I purchased the pet comfort feeding system recently and there is no comparison. The stainless steel grade of the bowls are very high grade and do not emit any odor like previous ones I have used in the past. The unit itself is very sturdy easy to clean and looks great. Thank you weathertech for always providing top notch products right here in my home state. Don’t hesitate to purchase these they are worth it! !